It is very common thing nowadays that even a small scale business has their own apps whether it is a huge shopping mall or just a normal restaurant. Having a mobile app developed for one’s business takes the level of marketing one step ahead. Developing a mobile app for your business will help you spread all the necessary information regarding your business to the public. The news about your special offers and other promotions can be done easily with just the touch of a finger. Be the first in your field of business to provide a facility of mobile app to your customers and take a big leap ahead your competitors. A complete flexibility in the app which will help you in better understanding your business goals. Highly logical solutions included in the app development covering all the satisfactory answers to the queries. Excellent business models solutions for industrial level apps. 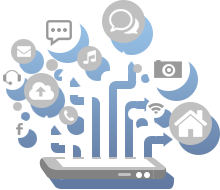 The pre-built components and modules and other micro apps will help reduce the time to publicize your app easily. Services to remove the mobile bugs and maintenance. We have successfully created some of the most engaging games and stunning games for iPhone especially specializing on entertainment in it. Arth-I-Soft has comfortably put itself amongst the top iPad Game development companies ion India. An android app developed for your business will reach billions of android users around the world. The gaming and entertainment have grown very big for the mobile industry and the android game development are growing at a very fast pace. The Windows app developer team at Arth-I-Soft has lot of experience in designing the applications, mobile app development and also working with lot of Microsoft technologies and tools. Our developers have very good experience with the standards of windows and understanding the requirements of the customers.